A Dizzy Mom Who Thinks Cooking is Fun! This was my saving grace when I was pregnant. I could have this, made with soy milk and it would do the trick for a meal. I couldn’t have ANY dairy for the first 6 months of my first pregnancy. It didn’t even stay down for 5 minutes. As long as I live, I will never completely recover from having to throw up potato cream soup. Ouch! I will admit, it does take a little getting used to (the oatmeal, in a smoothie, I mean), but once I got used to it, I started craving them. It is the perfect breakfast…it is quick, you can drink it in the car, you can make it the night before. Love it! This recipe comes to you courtesy of Let’s Bake the Robin Hood No-Sift Way, published in 1964. This cookbook is no less than legend in our family. It is literally in pieces, and has been repaired thousands of times. There are samples of recipes on several pages. Not being able to find the cookbook on a moment’s notice has been known to incite sheer panic. We have discussed multiple times scanning the cookbook in its entirety so there is no chance of losing the classic. My mother used to make this when we were young. I would practically skip around the kitchen, inhaling the sweet aroma of apples and cinnamon. When it was finally done, I would practically set my mouth on fire by trying to eat the wonderful concoction before it was cool enough to eat. To this day, the smell of apples and cinnamon baking, that smell wafting through the house, makes me so happy. This time of year I will put a little apple sauce, some cinnamon, ginger, cloves, etc. in a sauce pan mixed into about a quart of water. I just leave it gurgling away for a few hours on low. It smells like Halloween, Thanksgiving, and Christmas all rolled into one. 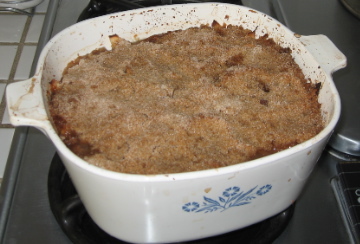 Arrange prepared apples in well-greased 9-inch square pan or well-greased 2-quart casserole. Sprinkle with water and lemon juice. Mix flour, brown sugar, granulated sugar and cinnamon. Cut in butter with pastry blender until mixture resembles coarse meal. Spoon crumb mixture over apples. Serve warm or cold topped with whipped cream or ice cream. Makes 9 servings (Yeah, right! ).